There was a panic in the world this morning as the most popular social networking site "Facebook" experienced being down for several minutes, about 30 minutes to be exact. The said problem affected the mobile services of facebook along with its homepage. The netizens reacted that made the hashtag #facebookdown at the top of the world trend. 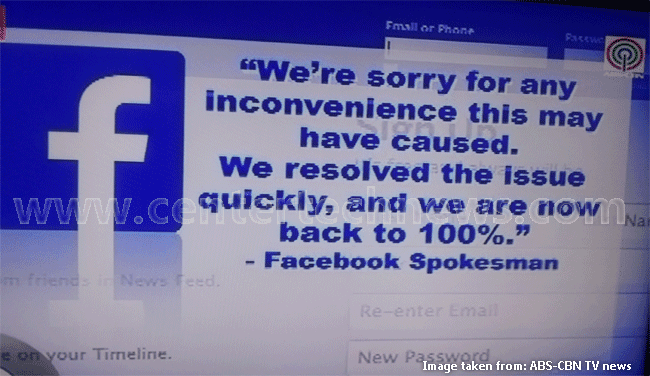 As of now, there is still no concrete evidence for the reason of facebook server's down. And on Twitter, there are several suggested ideas on what might be the reason for Facebook’s problem and one of them is DDos attack but there is still no confirmation on this. Facebook is more than just a social media to everyone since this is very easy and enjoyable to use that allows everyone to make a contact with other people. And not only this, Facebook is accessible to so many applications that so many people have invested with using.